CNRP supporters gather at Phnom Penh’s Wat Pothiyaram pagoda, June 2, 2017. Cambodia’s ruling and main opposition parties marked a final day of a two-week campaign period ahead of June 4 commune elections with huge rallies in the capital Phnom Penh Friday, with their respective leaders urging voters to back them in the polls, seen as a bellwether for a general ballot next year. Prime Minister Hun Sen made what was only his second appearance on the campaign trail as his ruling Cambodian People’s Party (CPP) kicked off the day’s events at 60-Meter Road in the capital’s Chak Angre Leu commune, before leading supporters through the city with its chief on the back of a flatbed truck. The Cambodian strongman, who has led his country for more than 30 years, again warned of chaos and instability if his party does not win the election, while addressing tens of thousands of supporters through loudspeakers along the route. “Please vote for the CPP so as to maintain peace, progress and development,” he said. Hun Sen raised the specter of Lon Nol, who led a 1970 military coup against then-Prince Norodom Sihanouk and became the self-proclaimed president of the newly created Khmer Republic, ruling until he was deposed by the murderous Khmer Rouge regime in 1975. “We already witnessed [such a mistake] when Lon Nol made a wrong decision on March 18, 1970 which, as a consequence, made our citizens victims ever since,” he said. The prime minister also warned opposition parties against challenging the outcome of Sunday’s vote, saying the country’s courts could dissolve them for doing so. The main opposition Cambodia National Rescue Party (CNRP) nearly unseated Hun Sen in 2013 elections and claimed it only lost due to voter fraud. The CNRP staged its rally hours later, beginning at 3:00 p.m. at Phnom Penh’s Wat Pothiyaram pagoda, with party president Kem Sokha telling a smaller turnout of supporters that his candidates want “positive change” for the country. “Our Khmer brothers and sisters used to enjoy renowned history during the Angkor era, gaining respect and admiration throughout the world,” he said. “Why are we now being criticized by the international community? Is this not because of our human rights violations, destruction of our natural resources, and corruption,” he questioned. 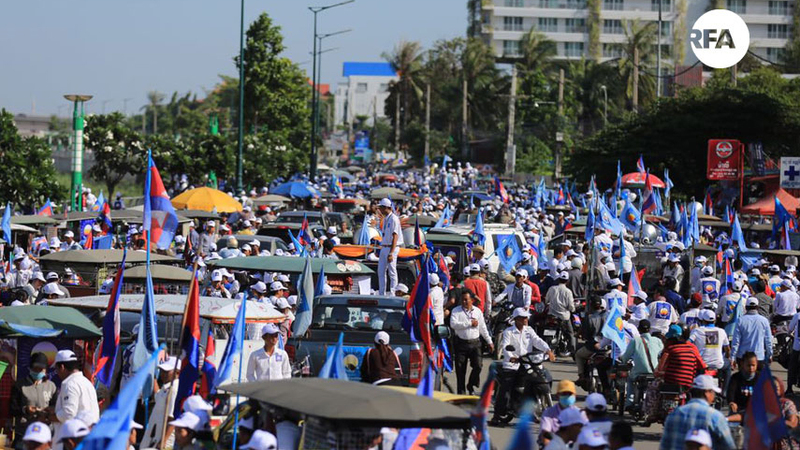 None of the other 10 smaller political parties competing for 1,646 commune council seats across Cambodia staged rallies in the capital Friday, though many held gatherings in other provinces around the country. The rallies came at the end of a 14-day campaign period that began on May 20 and has been relatively calm, compared to those ahead of previous elections, despite repeated threats from Hun Sen of civil war should the CPP lose. On Friday, the Situation Room group of NGOs—including the Committee for Free and Fair Elections in Cambodia (COMFREL), Licadho, and Adhoc—issued a statement evaluating the electoral process in the lead up to the polls, saying technical arrangements made by the National Election Committee (NEC)—the country’s top electoral body—had “produced more positive outcomes” than in previous years. “The political environment and security situation are free from any serious violence that may negatively affect the management of the election, [or the] political freedom of participating parties, associations, civil society organizations and voters,” the group said. The NEC, the group said, had “managed its work better than in the previous mandates,” including its recruitment and appointment of election officials, performance of duties, planning, training, use of law enforcement, and implementing of regulations and legal procedures. Cambodia’s voter list is of “better quality and more accurate,” while the registration of political candidates was “positive” and inclusive of women and a variety of different parties. The Situation Room applauded the election campaign for being held “positively and smoothly without any violence or disputes among parties leading to the obstruction of campaign activities,” though it noted restrictions by authorities with regard to the use of public compounds and freedom of speech. Preparation for the election and vote counting methods are “better,” including more effective methods of ensuring that each voter can cast only one ballot, it said. “Through general observations, Cambodia’s political environment and security did not experience any serious violence,” the statement said. While Cambodia’s campaign period was seen as one of the most free and fair of recent elections, opposition officials and supporters have reported several instances of obstruction. “The law [on the election of commune councilors] does not prohibit residents from various provinces from participating in a [campaign rally] in Phnom Penh,” he said. Sam Kuntheamy said that if the NEC had banned mobile campaign rallies, party presidents should not have been allowed to campaign in various provinces. Reported by Sothearin Yeang, Chandara Yang and Zakariya Tin for RFA’s Khmer Service. Translated by Sovannarith Keo. Written in English by Joshua Lipes.